It Is import to buy 1 salmon piece for the recipe as the fish needs to be under the grill long enough to char but still remain juicy inside. 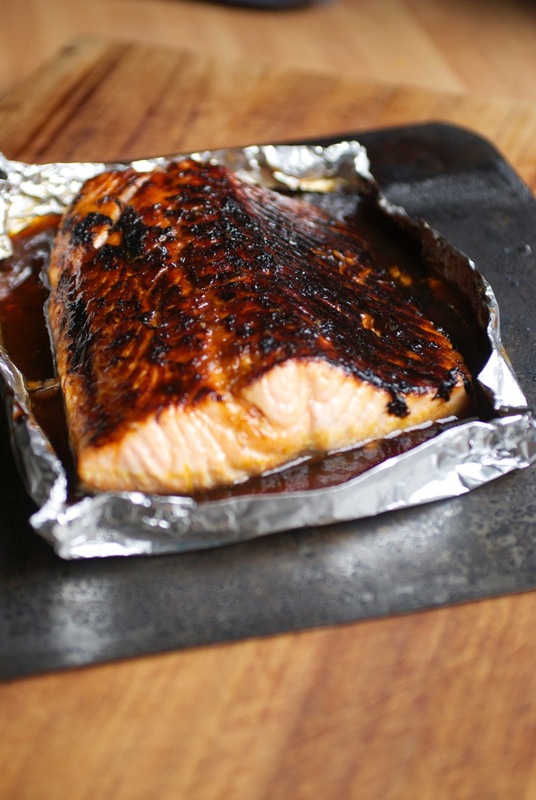 Fold some foil to create a double layer and make a dish, just a little larger that your piece of salmon and place on a baking tray. Mix together the marinade ingredient and pour into the foil dish. Place the salmon flesh side down in the marinade and leave for 20 minutes to 1 hour. Switch on the grill to the hottest setting. Turn the salmon so it is flesh side up and spoon over some of the marinade. Place the salmon under the grill and char until it is beautifully dark and flesh begins to flake as you press it with a spatula. This should take 10-15minutes depending on the heat of your grill and thickness of the fish. Sprinkle with Furikake and serve over steamed rice and green vegetables and tip the pan juices over the fish.